This article is intended for those new to investing and for those who want to learn how to better control their finances. 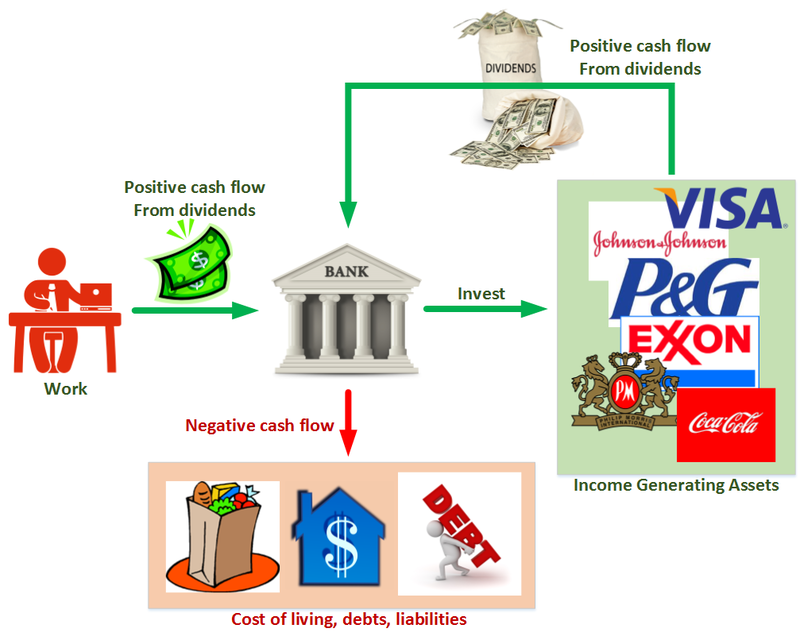 This post will talk about one's net cash flow, what it is, and how wealth is related to it. In order to create wealth, an investor needs to have extra cash to invest. Normally, cash can only be obtained by one's main vocation, existing income generating vehicles, inheritance, or charitable donations from others. When a person is starting from ground zero, the regular job will likely be the primary source of cash. Below is an illustration I drew to show what my plan is to generate wealth. It provides a simplified view to the "machine" that I plan to build. The machine described here is a cash generating vehicle. One can think of it like a money printing machine. Over time this machine will invest back on itself and upgrade its money printing capabilities. Having a high income does not make one wealthy. It took me some time to realize this but having a well paying job does not mean one can afford everything that comes with "looking apart". The cost of living is extremely important in determining one's net cash flow. If one has a very high income and a very high way of life, then he is just living high. But if one is wealthy and living a high way of life, then he is doing so because he has to means to do so indefinitely. Cash from income generating assets can be in many forms. This website talks mainly about dividend generating equities. But cash sources can be generated from things like rental income or patents or being the owner of a business. Living high without a substantial asset base is akin to living on the edge. Were one to lose employment, the cost of living will make one's net cash flow highly negative. If one has substantial car loans and housing mortgages to pay then the net cash flow will either eat away one's existing wealth pool or cause one to go into bankruptcy. It is highly advised that all sources of negative debt with high interest be flushed as soon as possible before building one's asset pool. The negative interest is effectively a negative snowball that severely hampers one's ability to build up wealth. I don't feel that it is necessary to live extremely cheap and starve oneself from enjoying life. As long as one has the positive net cash flow to do so then it is not a big issue to enjoy life. I am not a firm believer of extreme frugality but I also do not agree with buying in excess. I like to find areas where I can reduce my cost of living since reducing the negative cash flow elements will help speed up the positive wealth accumulation snowball. Every dollar put into assets will help generate even more cash which can be fed back to buy even more assets. By increasing the size of one's income generating assets, the positive cash flow from dividends increases over time. This creates a positive feedback loop that can grow exponentially. On the contrary, if one has a lot of liabilities (negative cash flow), one will be continuously pulled down into the ground. 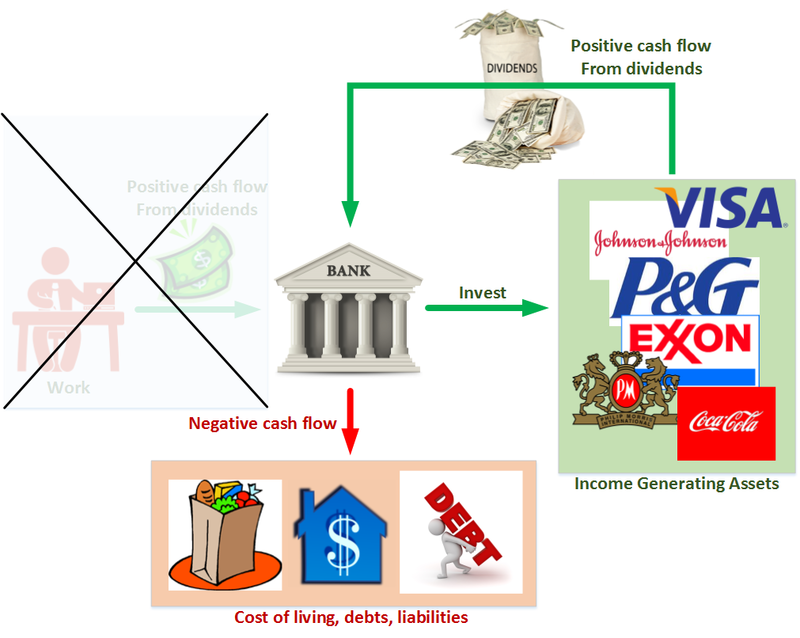 All positive cash flow sources will have to fund the negative cash flow sinks. This will hamper the positive feedback that helps generate wealth. Eventually, over time, the size of the income generating assets becomes so large that one no longer needs to work at his primary vocation in order to support the negative cash flow. For example, if one's dividend income stream is high enough to pay for one's food, housing, utilities, and transportation costs then one will not have to rely on a main job to pay for those expenses. If one's passive income is large enough to have money left over (even after paying for cost of living and liabilities), that is a very good position to be in since there will be money left over to grow the pool of income generating assets. My ultimate goal in the future is to have enough passive income to pay for a future mortgage, my food, utilities, and transportation costs. Once this goal is achieved, I will no longer have to worry about layoffs or unexpected events in life. This week Kinder Morgan (KMI) and Visa (V) have announced increases to their dividend payments. KMI raised their dividend per share from $0.49 to $0.51. Kinder Morgan raises their dividends frequently (can be every quarter) as opposed to once a year. Comparing the current 51 cents to the last year dividend payment of the same quarter, KMI has increased its dividend by around 15.90% year over year. Visa raised its dividend from 12 cents to 14 cents a share. That is around a 16.7% dividend increase. My goal is to reach a $1,000,000 dollars in assets less debts by my early 30's which should generate for me around $3000 a month in passive monthly income. My philosophy is passive income growth. Income generating assets with strong histories of growth are my choice of investment. My investing began in late 2013 when I started at ground 0. I fortunately did not have student debt since I only chose to attend the public schools that gave me a scholarship. I did not receive any inheritance and everything posted on this blog have been procured using my two hands. I also do not envision receiving financial assistance in the future, so I need to acquire my own capital if I want to be financially independent. I am not a high flying banker, business owner, or corporate manager. I am not from a wealthy family. I do hold a technical degree that can be attained rather affordably at a public university by someone who enjoys technical subjects and is willing to spend time studying. I am an engineer and like to look at the facts on a table and form an optimal solution. I am incredibly grateful that I can live in the United States. I feel that there are a lot of wealth opportunities available in this country if one picks the right vocation, works hard, studies one's vocation well, and reduces the desire to procrastinate. Procrastinating on one's plans or procrastinating on available opportunities will greatly hurt one's wealth, and procrastinating has always led to bad results for me. That is why I tried to graduate as soon as possible and get in motion my financial plan in my early 20's. I am nearly all invested. I hold some cash for emergencies but since I still live like a college student, I do not need a large emergency fund as the average person or family. I hold no CD or bonds since I don't believe in income generating assets that do not grow their income over time. All my investments are tied in U.S. equities because I live in the U.S. and plan on receiving and spending money in Dollars. Some of the equities I hold are multinational or international (but stationed in the US) so I am still vulnerable to currency fluctuations. I believe these currency changes are temporary and my investing horizon is in the decades which should average out currency fluctuations. My favored approach is with income generating assets with dividend growth stocks. Dividend growth stocks are different than other income assets like CDs and bonds in that they have what I like to call a multi-compounding effect. Compounding Effect #1. Dividend reinvestment: Cash dividends received can be reinvested into the companies that paid them, increasing one's share count year after year, which increases the dividends one receives year after year. Compounding Effect #2. Dividend increases: Cash dividends from dividend growth stocks increase year after year, increasing even further the cash one receives every year. Note that this stacks on top of the increasing number of shares from reinvested dividends; so if the yield is 3% and the company raises its dividend by 9% that year, the income grows by around 12% if one reinvests the dividend. Compounding Effect #3. Share price growth: Companies that raise their dividends year after year usually do so because they have increased earnings or cash flow. This results in higher share prices, which increases one's portfolio value. So in addition to accumulating ever increasing number of shares year after year from dividend reinvestment and dividend increases, one also sees each of those shares increase in price year after year. I view my stocks as employees, each generating increasing revenue every year. Price fluctuations in the stock are not of my concern as long as the business can successfully pay increasing dividends. If they are not cut for the job, the stock will be fired from my portfolio. My main objective is income acquisition and not market timing. My time horizon is so far out that buying at a 52-week high today will likely not make a difference decades down the road. I am a believer in dollar cost averaging: I will buy shares at the lowest lows and shares at the highest highs and in the long term everything will average out. A large chunk of my investments come from dividend champions with over 25 years of dividend increases. This demonstrates that the business is strong enough to increase their payouts even during many different recessionary periods. My ideal requirements are listed below for my core positions. • Financial Strength. Quality is stressed with very high priority. BBB+ credit rating minimum. In terms of rental property investment, I may consider that form of "passive" income in the future when I have more capital. I quote the word "passive" because rental properties are not truly passive even with a property manager. Rentals will require more work on my part and I am not sure how much spare time I will have in the future if I were to continue working. Rental properties also require a larger capital starting base since purchasing properties is a capitally intensive task. I prefer dividend stocks because they are truly passive aside from the followup research to keep up to date on the company news, which I think is easier for me than dealing with tenants and maintenance calls. For those new to dividend growth investing and want to learn more, I highly recommend these two books as starters. The SeekingAlpha website can also provide insightful commentary. I have added $2200 of MasterCard to my 401k account. MasterCard I feel has strong growth prospects in the future. MasterCard will benefit from their expansion to other developing countries. The yield is pitiful but I am investing in MasterCard for the long term capital gains. 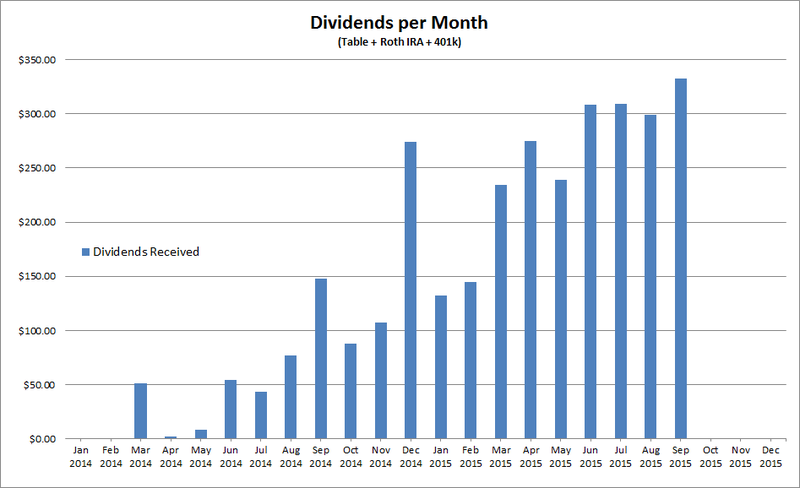 Eventually I believe MA will be able to be a dividend champion. Their dividend growth record so far has been nothing but fantastic. My activity has been low this month since unexpected things happened and I am using the cash as an emergency fund in case I need it. I am adding to my position in BDX. Becton, Dickinson and Company manufacturers and sells medical supplies, devices, lab instruments, antibodies, reagents, and diagnostic products. They are a dividend aristocrat with 43 years of dividend increase history. It has a low yield (around 1.8%) but it has steadily increased it around 13.9%. I believe the medical industry will benefit greatly as the baby boomer population reaches retirement age, increasing the US demand for medical products. BDX also has consistently increasing earnings and they are one of the most predictable companies in terms of meeting earnings expectations. 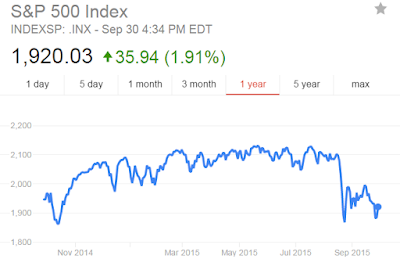 This month was extremely volatile. 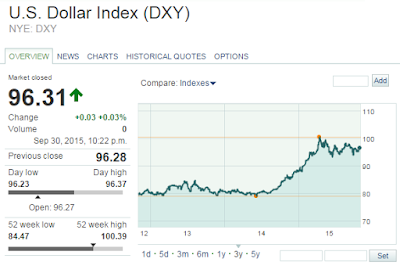 The market was not sure about the direction by the Fed as they continue to hold off on the rate hike. All sectors have been hurt. The energy sector, continues to be cheap. 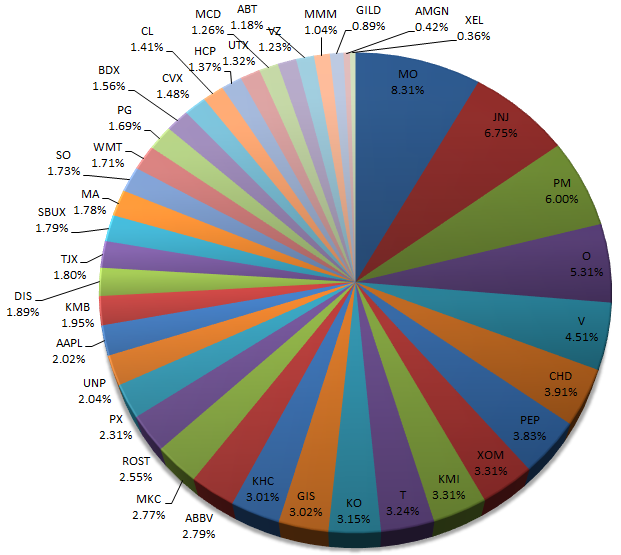 The MLPs this month were hit especially hard. Even higher quality names like EPD, MMP, and KMI. The healthcare sector was also out of favor as biotechnology stocks experienced higher volatility. The US Dollar (DXY) has sat flat for a long time after spiking to 100 several months ago. This reduces the pain felt by many of the multinational companies I own. I am enjoying the rise in volatility because of the drop in prices of many companies that I am watching. I was focusing on Healthcare this month. I have added decently to my initial position in Abbott this month and will continue to add on weakness. 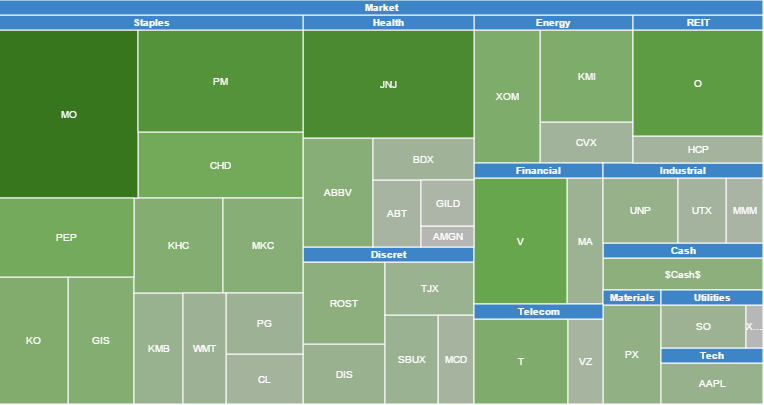 I am watching BDX and MDT as dividend champions in the healthcare sector to add on more weakness. I am already full on JNJ but will consider adding if it falls below $90. I will also consider adding more to my speculative positions in AMGN and GILD if the biotechnology continues to be out of favor. I do want to eventually own a healthcare plan company like UNH but they have not dropped as much. After the Fed refused to hike rates, companies on my Utility and REIT watchlist went higher so I am unable to add to those yet. I will continue waiting. My high priority picks are NEE and O.
I am holding back on adding more to Energy names. At the moment I feel uncomfortable with all of the names except XOM. The only name I will consider to add to is XOM. I have concerns about KMI's high debt levels and ability to the pay the dividend. I have some worry over CVX but I believe they can weather the storm for another year before the Gorgon project comes online. I do have more confidence in CVX than KMI in paying its dividend. I don't have much concern over XOM's ability to cover the dividend. Industrials have been refreshingly pulled back as well. Higher quality names on my watchlist include MMM and UTX. I will consider MMM if it goes lower than the drop last year in October. I will consider UTX if it goes over 3% yield. UTX hasn't popped the UTX yield since the financial crisis in 2008-2009 when it hit slightly above 4% (see graph below). Since MMM and UTX are industrials, they are volatile when the market is out of favor and I think I can get to the yield I want if I am patient. Below is a snapshot of my portfolio after the end of 9/30/2015. My portfolio has gone nowhere in the last several months due to the drawdowns in the market. But that does not matter since my income stream continues to grow week by week. The mission of the portfolio is to generate enough passive income to pay for all my living expenses. Companies will be carefully selected that meet a strict criteria of financial quality, dividend history, dividend growth, earnings stability, moat, and fair valuation. The portfolio has succeeded in generating $333 in passive income this month. It is estimated that this portfolio as it stands will generate annual dividend income of $4033. The current dividend increase announcements from all the companies I hold averages around 9.8% in dividend increase compared to the dividends paid last year. My portfolio currently yields around 3.3% in dividends.
. .. Equity + Cash … …..22 …..2 …..
At the moment I am heavy on staples and increasing my weighting in healthcare. My priorities are to have a stable base in staples, healthcare, and utility companies. These companies help create a solid foundation of stability as they offer products and services people will utilize no matter the economic environment. With these staples, healthcare, and utility companies in my portfolio, I can help minimize drawdowns during corrections while maintaining a consistent increasing dividend stream. A picture of my stock weights are shown in the tree map above. 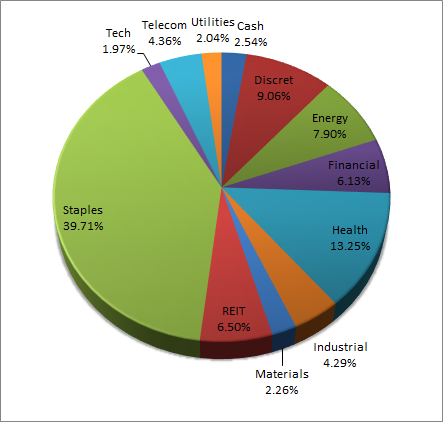 Here are my largest holdings in each respective sector. September was dividends as usual. No dividend reductions or cancellations have been announced so far. I have collected roughly $333 in cash this month from dividend paying stocks. This is a record amount of dividends for me so far and I expect this growth to continue as I keep contributing week by week. The big cash generators this month came from JNJ, PEP, XOM, and O. Even though Exxon and Chevron are in a world of hurt in the current energy environment, they still continue to pay dividends. In fact Exxon's dividend paid is actually an increase from the one from last year.